Freshman Brady Renner throws a pitch in the Colonials' 10-1 victory over The Mount. Renner recorded his first collegiate victory. Last time out, it all unraveled for freshman Brady Renner. It was his first collegiate start and he was up against top talent out in California. The 6-foot-3 righty did not record an out, giving up three walks and a balk. It was the type of first start saved for scary stories around the baseball campfire. But this time around, the Colonials did the roasting: They scored seven runs in the third inning to set themselves for the game. Before Renner could taste the benefits of a seven-run lead, he had to make it out of the first inning. On a windy Wednesday afternoon against Mount Saint Mary’s, Renner rocked and fired from the get-go to help GW win 10-1 and move to 9-6 before beginning conference play Friday. The first batter of the game for The Mount watched three straight strikes – a fastball and two breaking balls coming from a three-quarters arm slot. The next hitter grounded one back at Renner, who snagged the ball and threw him out. With a seeing-eye single through the right side and a catcher’s interference, a couple batters worked their way on with two outs. A couple balls to start the next batter, and head coach Gregg Ritchie yelled out from the bench, “Slow it down, Brady. Slow it down, kid.” He got a groundout and ended the inning. There would be no ghost story for Renner on Wednesday. He went five strong innings for his first collegiate win on 75 pitches – striking out four while allowing three hits, two walks and no runs. “Pregame, coach Ritchie really helped me in the bullpen with staying back, getting on top of the ball and just executing my pitches,” Renner said. It didn’t hurt to have a crooked number on the scoreboard to accompany him. GW would bat around in the third inning to score seven runs. The first one came on a walk after sophomore Eli Kashi led off the inning with a screaming line drive over the leaping try of The Mount’s shortstop, sophomore Joey Bartosic walked and freshman Robbie Metz singled. The inning kept rolling. With two outs, Kashi stroked another ball in the same inning to the left side of the infield for a bases-loaded RBI. Then Bartosic doubled in two with a slicing opposite-field hit down the right field line. The bullpen would eventually give up a lone run to the Mount in the sixth. Junior Randy Dalrymple got tagged for two hits and one run. Three other relievers would come in and get work to close the game, not allowing a base hit. The Colonials had a chance to score back in the second inning, but blew a couple hit-and-run signs, costing them a big inning. In the middle of the innings of the game, they fell into a lull with quick, unfocused at bats. Come the sixth inning, they tacked on one more run and then two more in the eighth. 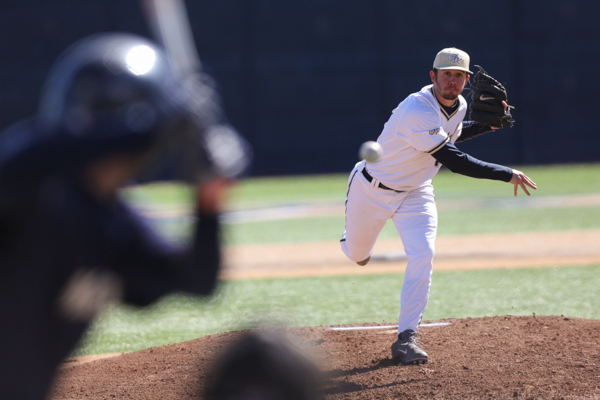 GW will begin A-10 play Friday at 3 p.m. against Saint Joseph’s in Philadelphia with junior Bobby LeWarne on the mound.